The Nanded district of Marathwada region has taken a lead in this mission in the state and 60,000 toilets have been constructed in the district within a year. Schools and anganwadis in the district have also been provided toilets and 500 villages have been made gutter-free by digging soak pits. Nanded is the headquarters of Nanded district and second largest city in Marathwada region after Aurangabad. It is one of the five districts in the region worst affected by drought. What is happening to the sanitation campaign in the villages? On February 3, 2016, the Maharashtra government declared 52 towns and cities as 'Free of Open Defecation'. About 7,000 villages till now have been declared open defecation-free (ODF) in Maharashtra. In May, while reviewing the progress of PM Narendra Modi's Swachh Bharat Mission (SBM) in Mumbai, the union minister for Urban Development Venkaiah Naidu said 50 more areas are set to join the list of ODF cities in the state. Time to rejoice! But is it? Water crisis in Maharashtra has reached its peak with the government declaring drought in over 29,000 villages in the state that has been witnessing such conditions for the second straight year. Out of the total villages declared ODF, many are from Marathwada and Vidarbha—the worst-hit regions. The drought scenario in the state forces us to think what will happen to the ambitious plan of making the state 100 per cent Open Defecation-free. Maharashtra may be the country’s fastest urbanising state but about 41 million people or members of every third household defecate out in the open. The situation prompted the state government to set a target of making all its 265 cities and 43,665 villages free of open defecation within three years of the launch of SBM in Maharashtra, in line with Modi’s initiative. It is indeed an ambitious plan, accepted by officials across departments. Therefore, government made a robust plan of constructing toilets in phases to meet the deadline. On completion of one year of the mission, 19 cities in the state and two wards in the city of Mumbai self-declared themselves to be ODF. On October 2, 2015, these cities were awarded by chief minister Devendra Fadnavis for their efforts. The second milestone was achieved in quick succession on January 31, 2016, when as many as 52 cities and two wards in the city of Mumbai were declared ODF. As many of the 6756 villages declared as ‘Free of Open Defecation’ are from the drought-prone areas of Vidarbha, Marathwada, North Maharashtra and Khandesh region, the government kept these regions out of the radar of SBM ranking. However, it is understood that cities and villages from these regions have been taken into consideration for the next phases. Keeping in mind the deadline promised to the Centre and the targets of ODF campaign for Maharashtra, it becomes imperative to take a closer look at the situation. When drinking water in the state has become a struggle what is happening to the sanitation situation in these cities? Yes, the situation in cities is little better than villages with latter being the worst hit. Despite all this, 219 villages from Latur district have been declared ODF. Small villages like Pardhi in Vidarbha region and Ekurke in Osmbanabad district from Marathwada region are examples of how commitment and determination of villagers changed the sanitation scenario. 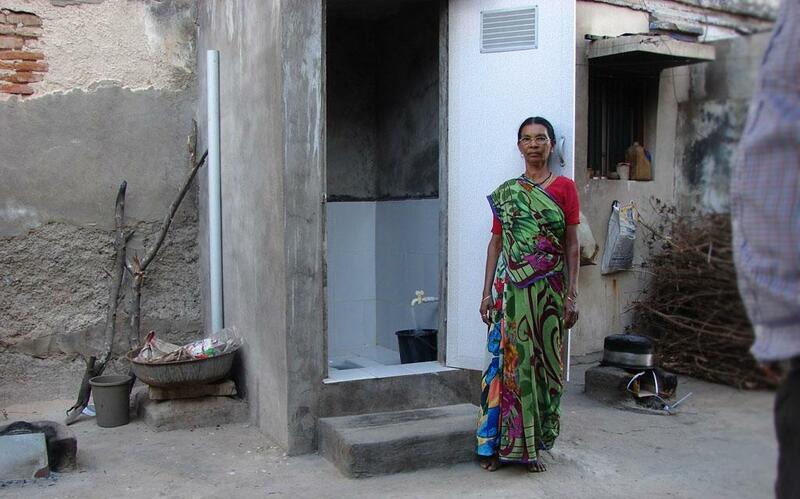 In 2013, the village Ekurke built 350 toilets and bought the shame of open defecation to an end. In Pardi, the framed ‘Nirmal Gram Puraskar’ hanging on Gram Panchyat walls tells the story of the village attaining full sanitation coverage in households, schools and aanganwadi centres. Today, the scenario is different in these villages. The same villagers that took pride in their household toilets have now taken to fields again. Almost the entire village is back to doing the morning ritual out in the fields because there is no water to ‘waste’. The experts acknowledge the fact that availability of only 200–300 litres of water per family per day is not enough for using in toilets which needs approximately 5-7 litres of water per flush. 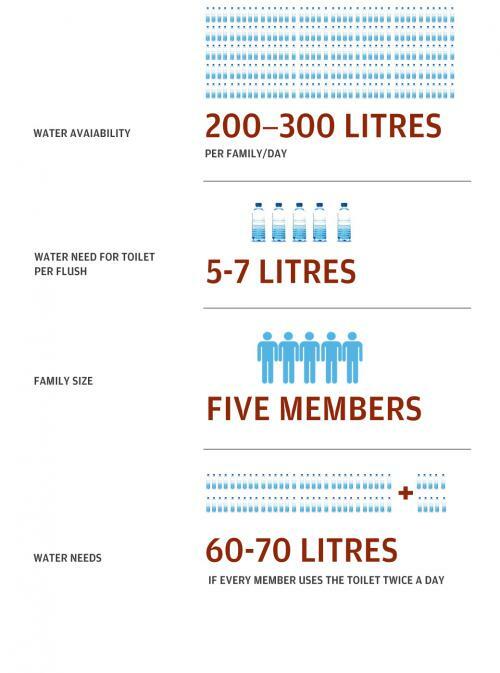 A household, which consists of minimum five members, will need at least 60-70 litres of water every day if every member uses the toilet twice a day. This is simply not possible with the limited water available. The officials monitoring the Swachh Bharat Abhiyan (SBA) acknowledge that drought has temporarily hit the campaign. Unfortunately, there is no mechanism to monitor the situation on ground so it cannot be counted upon. “If we show them that every household has its own toilet, the village is declared ODF,” as spoken by a government official from Kalamb tehsil. Dhawal Patil, a social scientist working in Maharashtra for long, said, “In conclusion, even though the villages theoretically show 100 per cent access to sanitation, open defecation is rampant in these villages. The construction of toilet has also been hampered due to scarcity of water. Civil construction needs water and in absence of it, creating a permanent structure is impossible. It cannot be expected that people would use water for constructing and using toilets when they have barely any to drink”. The officials and village heads seem to be keen on saying all is well with the sanitation programme as their villages has the required number of toilets needed to call it ODF. 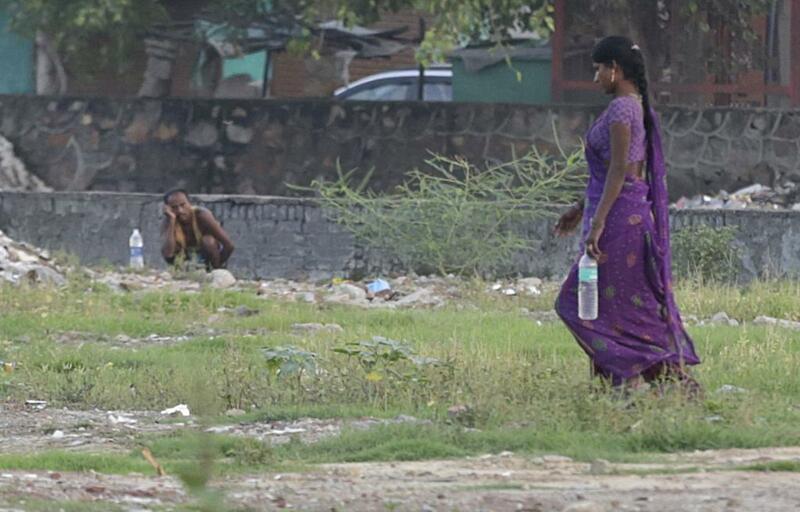 The fact that 80 per cent of villagers are defecating in the open is something they cannot comment on. This approach reminds us of the marketing and selling approach of corporates. Now the plan is to pump massive funds to install better toilet facilities and overcome the shortage of toilets. Replicating a model already launched for rural Maharashtra, the chief minister has now decided to provide Rs 8,000 per toilet from the state’s resources and Rs 4,000 per toilet from central funds to overcome the shortage in urban agglomerates. Urban local bodies have also been directed to fund up to Rs 5,000 per toilet from their own resources additionally for building toilets for households lacking such facilities. The main focus of the SBM campaign is access to toilets. Therefore, the whole country is focused on building toilets, but their usage is not looked in detail. Improvement in sanitation sector needs more than just construction of toilets because that doesn’t ensure their usage and a healthy and hygienic lifestyle. It needs to be seen that in a state, where drinking water has become an everyday struggle, how can water be made available for construction of toilets? According to officials, though it is difficult to say how many villagers are using toilets, water scarcity has definitely hit the construction of new ones. Both construction of toilets and their usage has been affected by water crisis. 800-1000 litres of water is needed to construct rural soak pit toilets and 200 litres for curing the roofing and plastering of a 6-ft-high toilet. This is, in the present scenario, ‘lot of water’. Following the target set under SBM, the state has built more than 1.4 million toilets in 52 cities and 6,756 villages earning the ODF tag. The officials coordinating the campaign regret that water crisis has affected the campaign. The state has given a directive that construction of toilets in the drought-hit areas should be stalled till the situation improves. What about water conservation strategy? Romit Sen, ex-deputy director, Centers for International Projects Trust, the India office for Columbia Water Centre, said, “When there is limited water, things need to be planned from the beginning to ensure water availability along with the toilets. Water conservation strategy like enhancing water management, improving storage capacity and demand and supply management should be promoted throughout the year and at every step”. To tackle water crisis, the state government launched Jalyukt Shivar Abhiyan to make Maharashtra a drought-free state by 2019. The programme aims at making 5000 villages free of water scarcity each year. The project involves deepening and widening of streams and river base and constructing cement and earthen stop dams, apart from building check dams, canals, small ponds, and wells (individual and community). Removing silt from lakes, ponds, farm ponds, and canals which prevents water percolation, also forms a part of the programme. Tree plantation and digging of farm ponds are covered under the programme as well. How to ensure toilet usage? Natural calamities are bound to emerge in various forms and shapes but we need to plan for climate-resilient projects. Maharashtra has seen a success story unfold in Hiware Bazar of Ahmednagar district where water conservation, water management and water intensive technologies helped the place stand tall even during drought. Instead of hoping that rain will restore the situation and the villages will be back to their toilets for their rituals, we should focus on integrated planning, wise use of technologies and adopting effective recycling and reusing systems.